Victor Matfield is a World Cup winner and a South Africa legend. 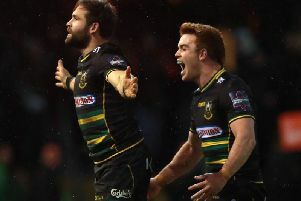 He rocked up at Saints in November having agreed to sign a deal until the end of the season and there was palpable excitement surrounding his presence at Franklin’s Gardens. The 38-year-old lock has gone on to make 11 appearances so far, with his team qualifying for the Champions Cup quarter-finals while experiencing a mixed season in the Aviva Premiership. And this week, Matfield took time to reflect on his Saints stay so far, stressing that he is desperate to make a big impact before leaving Northampton this summer. Below is our Q&A with the man who can consider himself among the pantheon of modern-day rugby greats. Victor, how have you found things since moving to Saints? “Firstly, I must say that the body is enjoying not playing week in, week out. “On the other side, I’m used to playing week in, week out so I’m sometimes finding it tough to really get momentum myself, not playing as often as I’m used to. “I wanted to come here and make a difference and maybe in a vital game I can do something well. Has it been a conscious thing from the coaches that they’ve given you a break when you’ve needed it? “Yeah. Before I came over I told them I’m not 32 or 34 any more, I’m a bit older than that. “They’ve been managing me well and we’re very fortunate to have a very good player like Daisy (lock Christian Day), who knows the structures really well here. What has your overall view of the club been and, in particular, the supporters? “I must say, the supporters are fantastic. “I’m used to pretty good support back home with the Bulls, but if you lose one or two games there the stands go empty. “Here, the fans just keep supporting you. Have you had a particular highlight of your time here? “I must say I enjoyed the Harlequins win, winning after the hooter. “I had a nice ski holiday as well, but I think the Harlequins win, and also our game against Racing at home. It’s your first experience of playing through an English winter. What have you made of that? “Training on the soft fields every day is not easy and the conditions don’t make it easy. “We’re used to playing where there’s no wind, but here you have to take the conditions into consideration. “It definitely makes it tougher, but hopefully it can get better and we can play some nice running rugby on Saturday. It’s a cliche, but the fact Saints have lost to the bottom three sides this season shows are no easy games this season, doesn’t it? “That’s probably the one thing that’s surprised me. I really thought there were four or five teams that stood out above the other teams when I used to look at the Premiership. “But I must say, every week’s a competitive game and there are so many great players that I didn’t know about. Worcester are an example of that competitive nature, aren’t they? “Worcester are a very good side. “There’s four of my old mates who I’ve played a lot of games with there. “There’s also quite a few players who’ve played for the Saints and I think that will make it more difficult for us because they’ll know how we think about the game and how we play it. This is another big week for Saints as you bid to get back in that top four, isn’t it? “It is an important week for us. We really started to build some momentum in the two games before Newcastle. “We just want to get straight back on the horse this week. “If we want to be in that top four, we definitely need to win all of our home games.